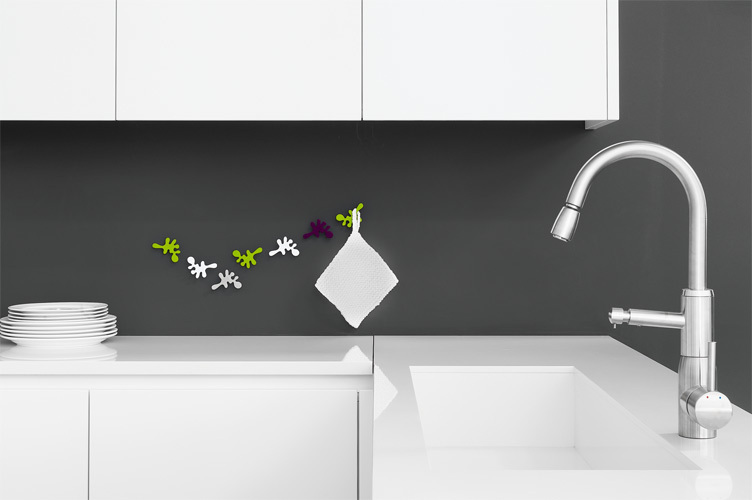 These little camouflage hooks are designed by duo Busk+Hertzog. Their designs are showcased all over the world and used in many public spaces. International airports, museums and the lounge of Chelsea FC in London. The Danish Museum of Art & Design has some of their designs in their permanent collections. These nifty little hooks can be used for kitchen utensils, bathrooms, jewelry and keys or just as decoration. Mini Camouflage is available in metal spray painted in various colours, or in stainless steel. Retail price is approximately € 25,00. For stockist information check Frost Design’s website. This entry was posted in Design, designers and online finds and tagged Airport design, Chelsea football lounge, Danish Design, Dusk+Hertzog, Frost Design, Mini Camouflage. Bookmark the permalink.